The freshwater pearl mussel is a bivalve mollusc that lives in clean, fast flowing rivers and streams. It is one of the longest lived invertebrates in the world, and with a lifespan of up to 130 years is Ireland’s longest living animal. Like all bivalve molluscs the freshwater pearl mussel has a shell that consists of two halves connected by a flexible hinge that can be opened to allow the animal to breathe, feed and move, and closed using powerful muscles to protect the animal’s soft body from potential predators and adverse conditions. The large, heavy shell is elongated, and at around 12-15 cm long is significantly bigger than its familiar marine counterpart. A large, muscular foot allows the mussel to move slowly, and to bury itself in the river bed,, where it spends most of its time filtering the water for food particles. Freshwater pearl mussels have a complex and unusual life cycle. They begin life as tiny larvae known as glochidia, released directly into the water column by female mussels in vast numbers between August and September. Most of these glochidia perish, swept downstream by the fast flowing water, but a few are inhaled by passing salmonid fish (trout or salmon), and snap shut on a filament of the fish’s gills. Here they grow in this oxygen rich environment, getting their nutrients directly from their temporary host until it reaches around six times their original size. At this point they have developed into into young mussels, and drop off their host to begin life as a filter feeder buried in the river bed. Freshwater pearl mussels grow extremely slowly. They feed by filtering food particles from the water column, with each adult mussel filtering up to 50 litres of water an hour. When mussels are abundant they play an important role in maintaining and improving the water quality, benefiting not just their own development, but the health of the river ecosystem as a whole. Once abundant throughout a geographic range spanning from North America, through Europe into Russia, the species has suffered massive declines, and is now critically endangered or extinct in many river systems where it was once common. The real turning point in the fortunes of the freshwater pearl mussel was the discovery that some individuals produce pearls (hence the name), which led to massive exploitation across much of its range. Thousands of mussels were killed in the pursuit of a single valuable pearl. Pearl “fishing” is now banned in most countries. Today, by far the biggest threat to the freshwater pearl mussel, which is classified as endangered on the IUCN red list and is protected in Ireland under European and Irish legislation, is the ongoing degradation of river systems by man. Eutrophication, water abstraction, bank erosion, pollution, alteration of the river’s flow profile, the introduction of exotic species and many other factors have a severe impact on the ability of mussel populations to thrive. Young mussels in particular need clean, oxygenated water to penetrate the sand or gravel of the river bed to survive. A layer of silt or algae that hinders the flow of oxygen rich water through the substrate will kill them, blocking this stage of the mussel’s life cycle and ultimately leading to population collapse. Anything that impacts the population of the host fish species in the river system will also affect the mussel’s ability to reproduce effectively. In Ireland the freshwater pearl mussel is still widely distributed in suitable river systems across the country — and its decline has been less rapid than in more industrialised European countries. However, this is a long lived species, and studies show that despite the presence of adult mussels in many suitable rivers, most have no young mussels in the river substrate. In some cases scientists estimate the last time young mussels were “recruited” into the adult population is as far back as the 1960s. 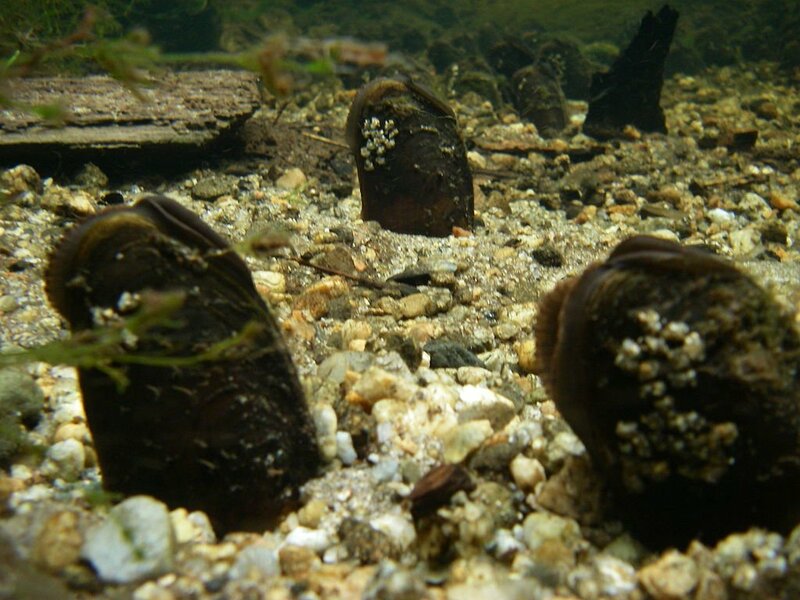 With continued negative impact on our river systems on the increase the fate of the freshwater pearl mussel in Ireland depends on the success of active conservation measures. It’s future here, and throughout its range, is far from secure. I note that they highly protected under EU & Irish legislation. As Salmonids are the primary host, surely this brings a new urgency to the whole question of Salmon Farms on the Irish coast & the damage that they have undoubtedly inflicted on all wild salmonids particularly our Sea Trout.